Rugby’s on for Saturday at 15th Street Site! 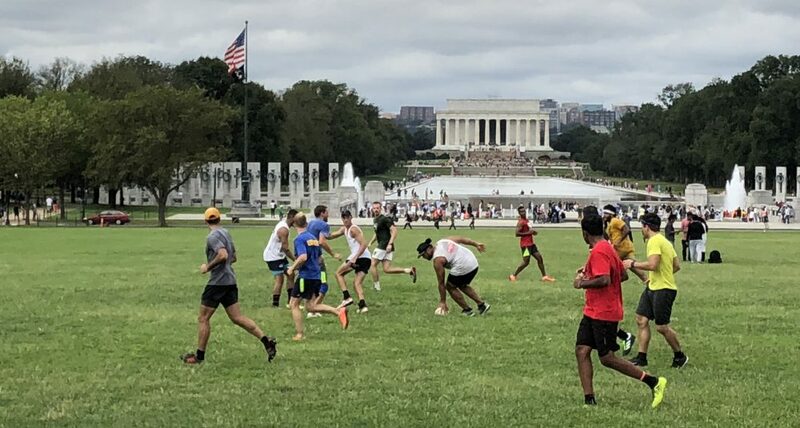 We’re testing out playing rugby at the 15th Street and Independence field tomorrow (our typical Wednesday field). I don’t think it’s occupied by anyone else at that time, so it should be a smooth transition. Be mindful there may be an onslaught of tourists headed to the Mall and tidal basin to see the cherry blossoms. Expect some crowds even early in the morning. Hopefully the tourists won’t pose too big of a hurdle for anyone’s commute. See everyone tomorrow at 9:30 a.m., 15th and Independence! Hey I’m new in DC, in from England and wanted to get involved. Is this open for everyone and how long do you guys usually play for?? Sandro, yes. All are welcome to play. Are we on tomorrow night?